E. of Scarbrough takes his Seat. The Lord Delawarr reported from the Lords Committees to whom the Bill, intituled, "An Act for naturalizing Amalie Sophie de Wallmoden," was committed: "That they had examined the Allegations thereof, which they found to be true; and that the Committee had gone through the Bill, and directed him to report the same to the House, without any Amendment." The Earl of Warwick made the like Report from the Lords Committees to whom the Bill, intituled, "An Act for repairing the Road between Hockliff, in the County of Bedford, and Stony Stratford, in the County of Buckingham," was committed. King's Answer to the Address for a State of the National Debt. The Lord Steward reported to the House, "That the Lords with White Staves, pursuant to their Lordships Order on Friday last, had presented to His Majesty their Address, for a State of the National Debt, provided or unprovided for by Parliament; and that His Majesty had been pleased to give Directions, that the same be laid before this House accordingly, as soon as it could be got ready." Protestants in America naturalizing, Bill. The Earl of Findlater (according to Order) reported from the Committee of the whole House to whom the Bill, intituled, "An Act for naturalizing such Foreign Protestants, and others therein mentioned, as are settled, or shall settle, in any of His Majesty's Colonies in America," was committed, the Amendments made by the Committee to the said Bill. "Press 4. Line 37. Leave out ["within the same Colony"]. "Line 38. After ["more"], insert ["as aforesaid, within the said Colonies, or some of them, to be specified in such Certificate, together with the particular Time of Residence in each of such respective Colonies, whereof the Colony under the Seal of which such Certificate shall be given to be One"]. "Pr. 5. Line 5. After ["Colony"], insert ["under the Seal whereof such Certificate shall be given as aforesaid"]." Hodie 2a vice lecta est Billa, intituled, "An Act for making more effectual Three several Acts of Parliament; One, of the Sixth Year of the Reign of Her late Majesty Queen Anne; and another, of the Eleventh Year of the Reign of His late Majesty King George, for repairing the Highways from Old Stratford, in the County of Northampton, to Dunchurch, in the County of Warwick; and the Third, made in the Tenth Year of His present Majesty's Reign, for making more effectual the said Two former Acts." Vis. Torrington. L. B. St. Davids. L. B. Bristol. L. Delawarr. Their Lordships, or any Five of them; to meet on Friday next, at the usual Time and Place; and to adjourn as they please. Inhabitants of Tetbury, Petition referred to Judges. The House being moved, "That a Petition of the Bailiff and principal Inhabitants of the Town of Tetbury, and of the Vicar of the Parish Church of Tetbury, in the County of Glocester, and of the Patrons of the Vicarage of the said Church, being Trustees of the Advowson, for the Benefit of the Town, for Leave to bring in a Bill, to sell the Perpetual Advowson of the said Vicarage; and to apply the Money produced by such Sale, together with the Money raised by a public Collection, to re-build the Parish Church and Chancel of the said Town of Tetbury, the same being very ancient and ruinous, and in manifest Danger of falling, may be exhibited to this House, in regard to the pressing Necessity of such Bill; notwithstanding their Lordships Order, that no Petition for a Private Bill should be received after the First Day of this Instant February:"
Ordered, That Leave be given to exhibit the said Petition, as desired. Accordingly the said Petition was presented to the House. It is Ordered, That the Consideration thereof be, and is hereby, referred to the Lord Chief Justice of the Court of Common Pleas and the Lord Chief Baron of the Court of Exchequer; with the usual Directions, according to the Standing Order. D. Hamilton peremptorily to answer Earl of Selkirk's Appeal. The House was informed, "That James Duke of Hamilton and Brandon had not put in his Answer to the Appeal of John Earl of Selkirk and Ruglen, though duly served with the Order of this House for that Purpose." Ordered, That the said Respondent do peremptorily put in his Answer to the said appeal, in a Week. 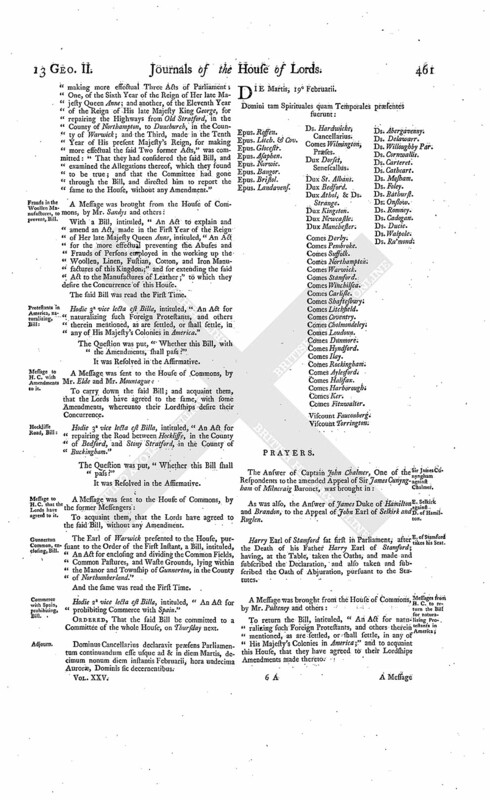 It is Ordered and Adjudged, by the Lords Spiritual and Temporal in Parliament assembled, That the said Petition and Appeal be, and is hereby, dismissed this House; and that the said several Interlocutors therein complained of be, and the same are hereby, affirmed: And it is further Ordered, That the Appellants do pay, or cause to be paid, to the Respondent, the Sum of One Hundred Pounds, for his Costs in respect of the said Appeal. Hodie 3a vice lecta est Billa, intituled, "An Act for naturalizing Amalie Sophie de Wallmoden." Dominus Cancellarius declaravit præsens Parliamentum continuandum esse usque ad et in diem Veneris, decimum quintum diem instantis Februarii, hora undecima Auroræ, Dominis sic decernentibus. The Earl of Warwick reported from the Lords Committees to whom the Bill, intituled, "An Act for making more effectual Three Acts of Parliament; One, of the Sixth Year of the Reign of Her late Majesty Queen Anne; and another, of the Eleventh Year of the Reign of His late Majesty King George, for repairing the Highways from Old Stratford, in the County of Northampton, to Dunchurch, in the County of Warwick; and the Third, made in the Tenth Year of His present Majesty's Reign, for making more effectual the said Two former Acts," was committed: "That they had considered the said Bill, and examined the Allegations thereof, which they found to be true; and that the Committee had gone through the Bill, and directed him to report the same to the House, without any Amendment." Frauds in the Woollen Manufactures, to prevent, Bill. 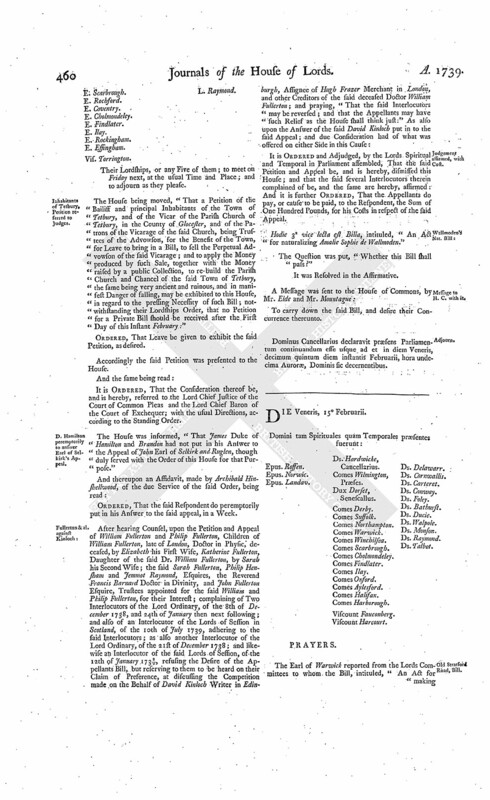 With a Bill, intituled, "An Act to explain and amend an Act, made in the First Year of the Reign of Her late Majesty Queen Anne, intituled, "An Act for the more effectual preventing the Abuses and Frauds of Persons employed in the working up the Woollen, Linen, Fustian, Cotton, and Iron Manufactures of this Kingdom;" and for extending the said Act to the Manufactures of Leather;" to which they desire the Concurrence of this House. Hodie 3a vice lecta est Billa, intituled, "An Act for naturalizing such Foreign Protestants, and others therein mentioned, as are settled, or shall settle, in any of His Majesty's Colonies in America." Hodie 3a vice lecta est Billa, intituled, "An Act for repairing the Road between Hockliffe, in the County of Bedford, and Stony Stratford, in the County of Buckingham." The Earl of Warwick presented to the House, pursuant to the Order of the First Instant, a Bill, intituled, "An Act for enclosing and dividing the Common Fields, Common Pastures, and Waste Grounds, lying within the Manor and Township of Gunnerton, in the County of Northumberland." Commerce with Spain, prohibiting, Bill. Hodie 2a vice lecta est Billa, intituled, "An Act for prohibiting Commerce with Spain." Dominus Cancellarius declaravit præsens Parliamentum continuandum esse usque ad & in diem Martis, decimum nonum diem instantis Februarii, hora undecima Auroræ, Dominis sic decernentibus. Sir James Cunyngham against Chalmer. E. Selkirk against D. of Hamilton. As was also, the Answer of James Duke of Hamilton and Brandon, to the Appeal of John Earl of Selkirk and Ruglen. E. of Stamford takes his Seat. Harry Earl of Stamford sat first in Parliament, after the Death of his Father Harry Earl of Stamford; having, at the Table, taken the Oaths, and made and subscribed the Declaration, and also taken and subscribed the Oath of Abjuration, pursuant to the Statutes. To return the Bill, intituled, "An Act for naturalizing such Foreign Protestants, and others therein mentioned, as are settled, or shall settle, in any of His Majesty's Colonies in America;" and to acquaint this House, that they have agreed to their Lordships Amendments made thereto. 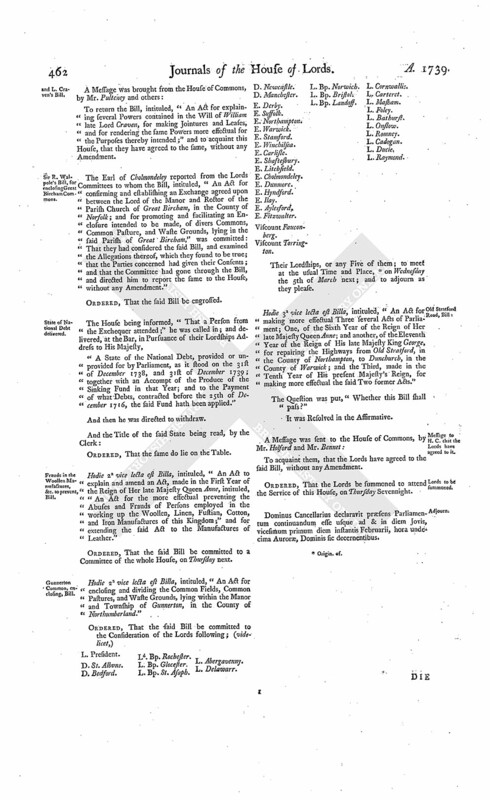 To return the Bill, intituled, "An Act for explaining several Powers contained in the Will of William late Lord Craven, for making Jointures and Leases, and for rendering the same Powers more effectual for the Purposes thereby intended;" and to acquaint this House, that they have agreed to the same, without any Amendment. 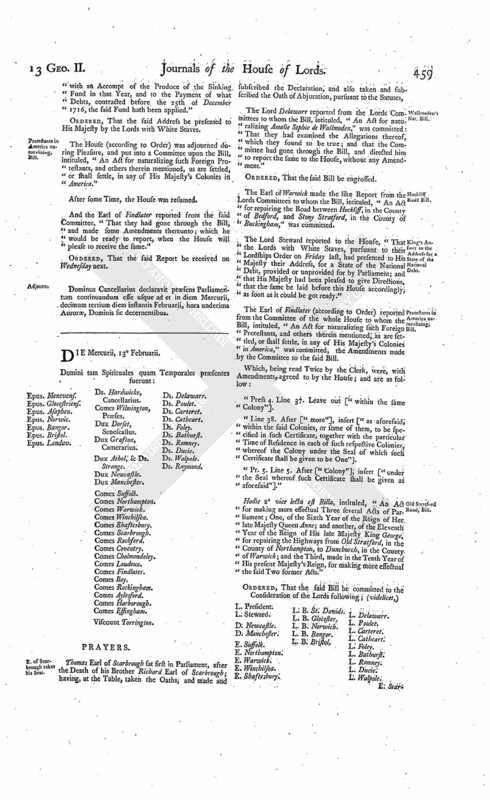 Sir R. Walpole's Bill, for enclosing Great Bircham Commons. The Earl of Cholmondeley reported from the Lords Committees to whom the Bill, intituled, "An Act for confirming and establishing an Exchange agreed upon between the Lord of the Manor and Rector of the Parish Church of Great Bircham, in the County of Norfolk; and for promoting and facilitating an Enclosure intended to be made, of divers Commons, Common Pasture, and Waste Grounds, lying in the said Parish of Great Bircham," was committed: That they had considered the said Bill, and examined the Allegations thereof, which they found to be true; that the Parties concerned had given their Consents; and that the Committee had gone through the Bill, and directed him to report the same to the House, without any Amendment." "A State of the National Debt, provided or unprovided for by Parliament, as it stood on the 31st of December 1738, and 31st of December 1739; together with an Accompt of the Produce of the Sinking Fund in that Year; and to the Payment of what Debts, contracted before the 25th of December 1716, the said Fund hath been applied." Frauds in the Woollen Manufactures, &c. to prevent, Bill. Hodie 2a vice lecta est Billa, intituled, "An Act to explain and amend an Act, made in the First Year of the Reign of Her late Majesty Queen Anne, intituled, "An Act for the more effectual preventing the Abuses and Frauds of Persons employed in the working up the Woollen, Linen, Fustian, Cotton, and Iron Manufactures of this Kingdom;" and for extending the said Act to the Manufactures of Leather." Hodie 2a vice lecta est Billa, intituled, "An Act for enclosing and dividing the Common Fields, Common Pastures, and Waste Grounds, lying within the Manor and Township of Gunnerton, in the County of Northumberland." Their Lordships, or any Five of them; to meet at the usual Time and Place, (fn. 1) on Wednesday the 5th of March next; and to adjourn as they please. Hodie 3a vice lecta est Billa, intituled, "An Act for making more effectual Three several Acts of Parliament; One, of the Sixth Year of the Reign of Her late Majesty Queen Anne; and another, of the Eleventh Year of the Reign of His late Majesty King George, for repairing the Highways from Old Stratford, in the County of Northampton, to Dunchurch, in the County of Warwick; and the Third, made in the Tenth Year of His present Majesty's Reign, for making more effectual the said Two former Acts." Ordered, That the Lords be summoned to attend the Service of this House, on Thursday Sevennight. Dominus Cancellarius declaravit præsens Parliamentum continuandum esse usque ad & in diem Jovis, vicesimum primum diem instantis Februarii, hora undecima Auroræ, Dominis sic decernentibus.